"Oh, thank you. Yeah, thanks a lot." Johnny was on the phone with someone. He was wearing a tux in preparation for his wedding with Lisa, his future wife. Not the wedding itself, but the wedding photos, which they were taking a month before the wedding for some reason. 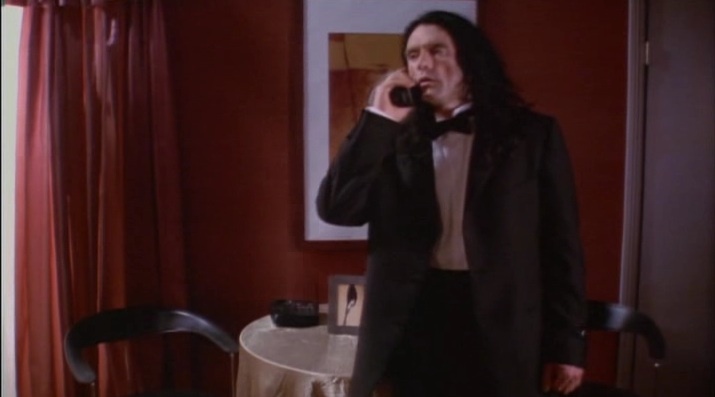 Just as he was hanging up the phone with who ever was on the phone, Denny walked in. He was holding the football in his hand, and he too was wearing a tuxedo. "Oh, hi Denny! Nice tux! You look great!" "You look really handsome." Denny replied to his father-figure. "Your wedding picture is going to look great!" Ding-dong! It was the door! Denny rushed ov er to open it. "Hey, Peter! Come on in!" "Oh, hey Peter!" Johnny greeted. "Hey guys." Peter said, closing the door behind him. "You look good too!" Denny said. Johnny gestured towards a sofa-seat. "Sit down!" Denny rushed over and opened it. What he saw on the other side startled him. It was Mark. Clean shaven. He used to have a beard, but he didn't anymore. And it was blowing everyone's minds. "Wooooaaahhhhhh!" Johnny exclaimed in awe. "Hey guys." Mark said casually, like it was no big deal that he had just shaved his beard. "You like it?" "Yeah! It looks good!" Peter said. "You look good," Johnny said, "you look like a baby face." Denny waved the football. "You guys wanna play some football?" "In tuxes? No, you gotta be kidding." Peter groaned. Denny turned to Mark. "Come on, Mark, let's do it." "I'm up for it!" Mark said. Johnny gestured towards the sitting-psychologist. "Ask Peter!" "No, I don't think so." Peter said, shaking his head. Denny nearly got on his hands and knees to beg he wanted to football with everyone so hard. Peter was steadfast in his refusal. "Come on!" Denny said, and then he started chirping like a chicken. "Cheep, cheep, cheep, cheep!" Immediatly, Johnny and Mark followed suit. "Cheep, cheep, cheep, cheep!" They all chirped, flapping their arms in unison as if they too were chickens. Peter could do nothing but smile, and of course, moments later they were running down an alley in their tuxes, throwing the football back and forth, hollering all the way. "Catch, Johnny!" Denny exclaimed, throwing the football to Johnny. He caught in flawlessly. "Yeah! Nice snag!" Denny said. Johnny threw the ball to Peter, who caught it. "All right Peter!" Denny cheered. Peter threw it to Denny, who threw it to Mark. "Here we go Mark!" Mark intercepted the ball. "Come on! Come on!" Johnny encouraged. Mark chucked a low one at Denny's crotch. Denny grabbed it just in time, stumbling with the ball before getting a firm grip on it. "Fetch Mark!" he said, throwing it right back to Mark. Mark gestured at Peter to go long. "Go!" Peter stood for a moment. "Go deep!" Denny yelled out. Peter darted on his heel and ran out. Mark wound up, but before he could fire his fist canon full of pigskin, Peter tripped on himself and fell face-first onto the ground. His friends ran over to him in a flash. Denny smiled. "Gee Peter, your clumsy." "All right, that's it. I'm done." Peter grunted, pushing himself back up. "Great idea Denny." Johnny, Mark and Denny helped Peter up, then disappeared into the alley. And with that Peter, perhaps because he was tired of being mocked consistently, was gone from the plot. PS Glad to see you're still writing these! "Denny nearly got on his hands and knees to beg he wanted to football with everyone so hard." "He used to have a beard, but he didn't anymore. And it was blowing everyone's minds." Too much fist cannon. Brilliant. So Peter died of his football injuries? How tragic. Do you know if Tommy Wiseau has heard of this blog yet? Not to my knowledge, but I'll be meeting him in January at a screening here in Ottawa, so I'll ask him about it then (also, I will take so many pictures and I will post them all). I got hiccups laughing and it hurts. Denny said, and then he started chirping like a chicken.